Our Blessed Lord is calling us to keep company with Mother Mary on the Way of the Cross during Lent. Mary can aid us to peer into the mystery of the passion and death of Jesus to discover a love we need so desperately. She will protect us from countless temptations in the desert of Lent when the devil would like to sift us like sand. He fears Mary and would rather flee than be near the Woman, the New Eve: obedient and full of grace! Mothers are adept at helping us to clean up, get ready, and put things in proper order again. Mothers are skillful at applying healing salves to the wounds of children. Mary excels at holding us close to her heart in an embrace that brings peace and strength. Mary never tires of repeating the truth that we are beloved of God. She can help break the chains that bind us from true freedom such as those pesky addictions (alcohol, food, TV, etc. ), the compromises (missing times of prayer and the sacraments, illicit relationships, numbing laziness, or frenzied busyness). If we invite Mary into our brokenness, her holiness will take over and help to sever whatever binds us from authentic freedom, love and joy. She doesn’t invade our lives; we need to invite her in. Mary enriches our Lenten spiritual journey as only a mother can do. Take up Mary’s spiritual practices, which likely included, praying the Psalms, meditating on the Scriptures, offering hymns of praise and gratitude to God such as her Magnificat, Lectio Divina. Imitate Mary’s courageous “yes” more intentionally as you walk the Stations of the Cross with her. Sing the Stabat Mater to console her Immaculate Heart. Imitate Mary’s complete focus on her Son Jesus during all the phases of his suffering; and her intercessory prayers. Pray for priests, the beloved sons of Mary. Strive to live Mary’s faith, hope and love, simplicity, sacrifice, service and obedience—even in the face of such terrorising agony. With Mary, sit at the feet of Jesus, choosing the better part – try to attend Eucharistic Adoration more frequently and read John’s Gospel, Chapter 19. Take up Mary’s “beads”, the holy Rosary. Intentionally, live Mary’s memories! Linger in contemplation of the Sorrowful Mysteries, asking Mary to help you encounter Jesus in His Passion that you may love him more deeply. Consider when Jesus breathed his last and Mary obeyed when He said, “Behold your son”—John the Beloved. She took him into her heart and brought forth the best of his Priesthood. Consider the vocation of spiritual motherhood or fatherhood of priests. 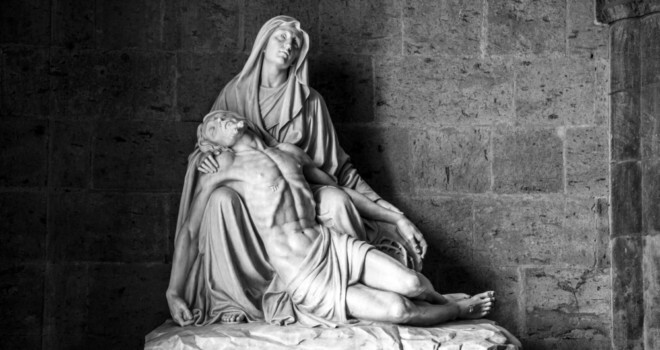 Console the Sorrowful Mother along the Via Dolorosa, offering to share in her pierced heart for love of God and neighbour.